Scuba diving in Palm Beach can be very diverse. There is something for everyone! Take today for example. After yesterday’s phenomenal goliath grouper dives, one of our customers decided to charter the boat for himself to dive and photograph the groupers again. That’s dedication! In order to take advantage of the best visibility and to have the groupers all to himself, we headed out at 6:30AM to the wrecks. Two dives later and our photographer friend had plenty of goliath grouper photographs and stories in the bag. Back before lunch, we headed out again, but this time with an eager bunch of spiny lobster hunters. Just as dedicated as our underwater photographer, they chose dive sites that were out of the norm. These weren’t the breathtaking dives sites, like Breakers reef, but there was still plenty to see. Most importantly of all, there were lobsters… Lot’s of lobsters! 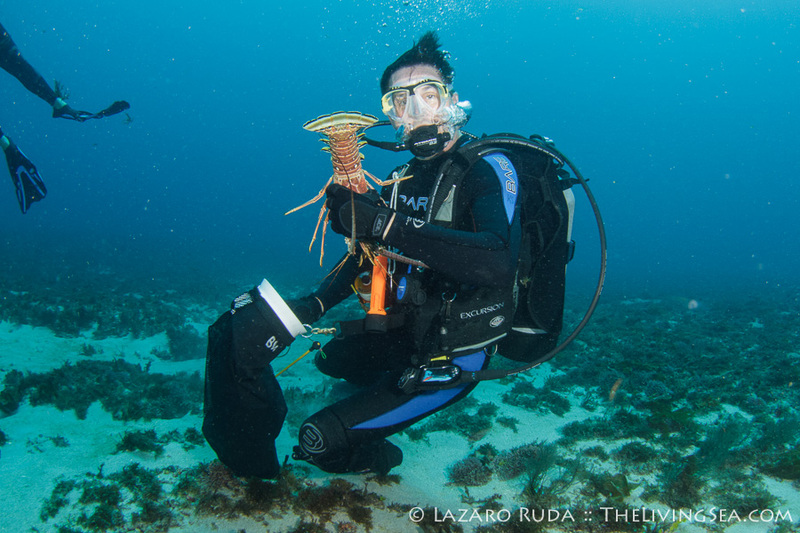 I tagged along with them to get photographs of these divers in pursuit of these tasty crustaceans. Along the way we encountered numerous marine life including a bull shark, hawksbill sea turtle, a gorgeous anemone, eels, and more. These lobster hunters were even kind enough to let me spend a little quality time photographing a beautiful slipper lobster before letting it go. Part of the fun of these types of dives is the opportunity to do some exploratory dives. Going off the regular path and finding some random place to jump in is always fun. In truth, the dive site is not all too random. Captain Bill and Mike Walker busied themselves at the bridge staring at the depth finder looking for any unique profile while the other went through his secret list of hunting dive sites during our surface interval. I watched them work their magic and decided to throw a little humor into the mix… Sneaking up behind Captain Mike Walker, I stared down at the depth and noticed the landmark due west of us and said to him, “You know.. If you’re in 86 feet of water, off this (secret) landmark, then this is MY spot. I originally found this spot. I call it the Cuban Cafeteria!” They both had a good laugh out of it and Captain Bill Walker named it so. By the way, the Cuban Cafeteria dive site turned out to be a big hit! The lobster hunters scored big on this dive site. And guess what? So did the Cuban photographer! Not only capturing some great critters photos during the dive, but photographing a sailfish, too! 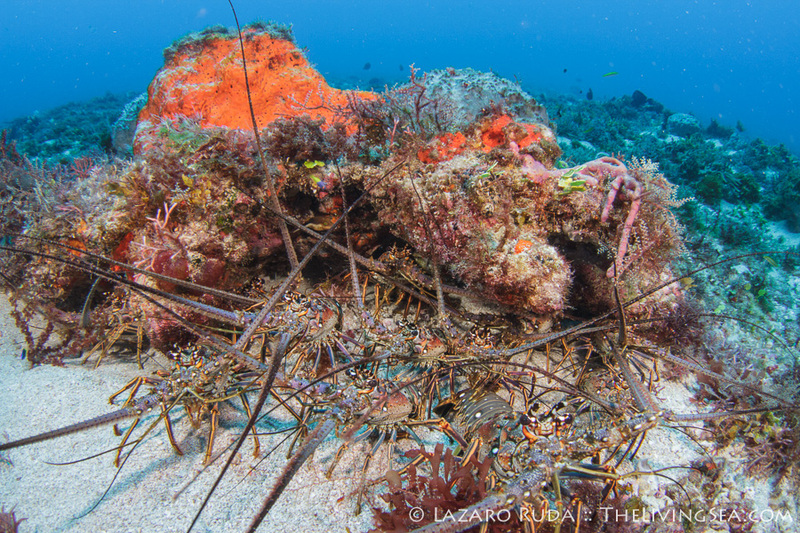 Make sure to ask for this dive site next time you’re on the boat looking for Florida spiny lobsters. Finding lobsters past lobster mini-season in Florida is not difficult if you know where to look. Diving off the regular path is definitely worth doing. You never know what great things you will see. 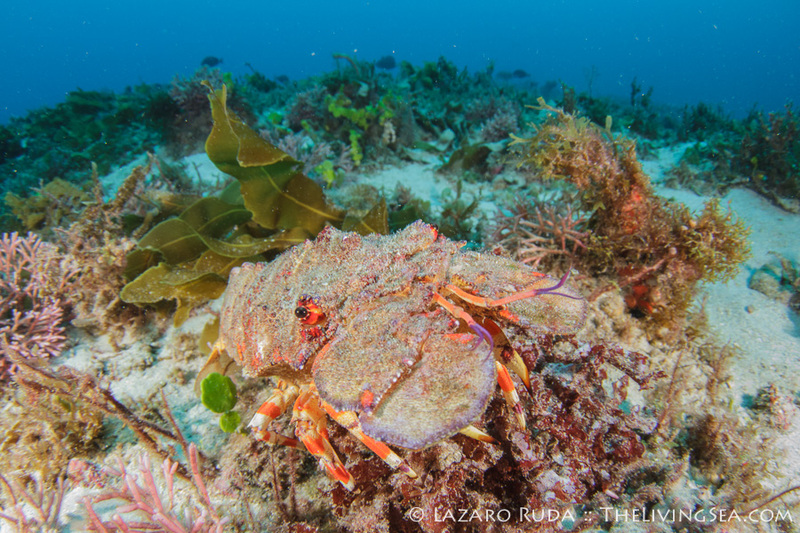 And the chances are, if you’re hunting for lobsters, you’re going to find lots of lobsters, too! Our trusty dive guide, Allison Knox. The bigger the smile = the bigger the lobster you’ll find! Look behind you! There’s another lobster. I got this one… Lobster in the corner pocket! Lets give this one to the photographer! Someone else is eyeing dinner! ‹ Best Goliath Grouper Diving!